Three bedroom townhouse with loft, cellar, and small garden. 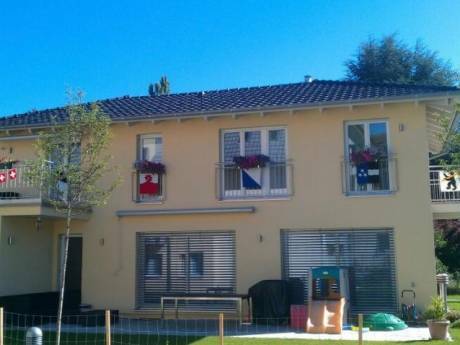 Our home is a very sturdy, comfortable, private Swiss-quality townhouse which is bright during the daytime and yet comfortably cool in the summer weather (Swiss insulation standards). We have a lovely little back patio with a tiny pond. We have four floors: the basement, which includes a studio, plus the large laundry room with extra refrigerator and freezers, and a large area for coats, shoes, luggage, and outside toys. On the ground floor you will find our kitchen and living room (with the dining table, sofa and chair, and a grand piano), and a WC (toilet and sink). On the upper level we have three bedrooms, one a master suite with a large bathroom (bath and shower), and two children's bedrooms with a shared hall bathroom (shower, toilet, sink). Above these is the spacious loft with high ceilings, two fold-out beds, a television and DVD system, a crosstrainer, small weights, exercise mats, and of course exercise DVDs. We are a family of four, with two children, ages 12 and 10. My husband works in insurance, and also plays the double bass in regional orchestras and chamber groups. I am a classical singer and writer. My daughter plays the violin, my son the piano. Our first exchange with a family in London was a success on both sides, and we look forward to many more happy exchanges. Exchanges for 2010 have been arranged. Our earliest next planned exchange will be in spring of 2011, when we hope to visit Paris. 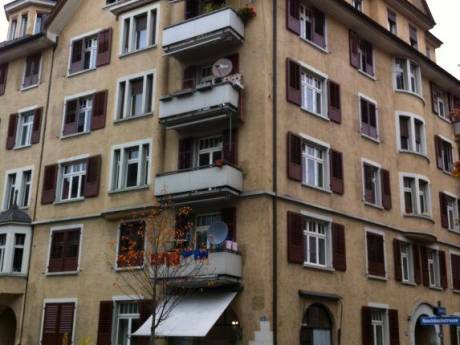 We are about 4km from the city of Zürich, and we are a 25-minute drive from the airport. We live in an extremely safe area with a lot of children, next to the village primary school where children are free to play. 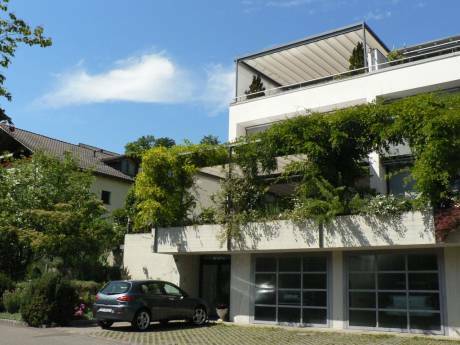 We are very near tennis courts, horseback riding, various swimming options (two lakes, including the stunning Lake Zürich, many wonderful swimming pools, and swimming fun parks), a golf course, boatrides and speedboat rentals on Lake Zürich. A daytrip will even bring you to summer glacier skiing. Our neighbors are polite and private, and several speak English. We have four mountain bikes for those who would like to explore our local trails, including the one enclosing the relatively flat Greifensee (lake) nearby. If you have not visited Switzerland, it is interesting to note that they have cultivated maneuverable, civilized trails which connect village to village through their pristine forests and fields, so that you could literally walk or bicycle safely and comfortably to any place in Switzerland. Utterly dependable and extensive public transportation is famously safe and clean, and will take you anywhere in Switzerland; of course you can easily connect with international trains as well. You might well consider using our home as a base for forays into the various mountain locales of Switzerland, or even into Italy, Austria, Germany, or France, all of which border Switzerland.